Pedestrian and bicycle projects receive less than 2 percent of federal transportation dollars in the U.S. Photo by Eric Allix Rogers. While obesity levels increased by 156 percent between 1960 and 2009, bicycling and walking levels fell by 66 percent. These are statistics from a new report by the Alliance for Biking and Walking. The report, “Bicycling and Walking in the United States: 2012 Benchmarking Report,” ranks all 50 states and the 51 largest U.S. cities on bicycling and walking levels, safety, funding and other factors. The Benchmarking Report confirms that in almost every city and state, pedestrians and bicyclists are disproportionately at risk of being killed on the road. The report also reveals that pedestrians and bicyclists receive less than their fair share of transportation dollars. While the report concludes that bicycling and walking create 11-14 jobs for every $1 million spent, as opposed to 7 jobs created by every $1 million spent on highway projects, pedestrian and bicycle projects receive less than 2 percent of federal transportation dollars. Furthermore, according to cost-benefit analysis conducted by the study, for every $1 invested in bicycling and walking, $11.80 are gained in benefits. The report adds to the evidence of health benefits of active transportation, showing that states with the highest rates of bicycling and walking are also among those with the lowest rates of obesity, diabetes and high blood pressure. “The data points to one conclusion: Investing in biking and walking projects creates jobs, leads to more people biking and walking, and improves safety and public health,” says Jeffrey Miller, president and CEO of the Alliance for Biking and Walking. The report also received praise from John Pucher, an urban planning professor at Rutgers University. 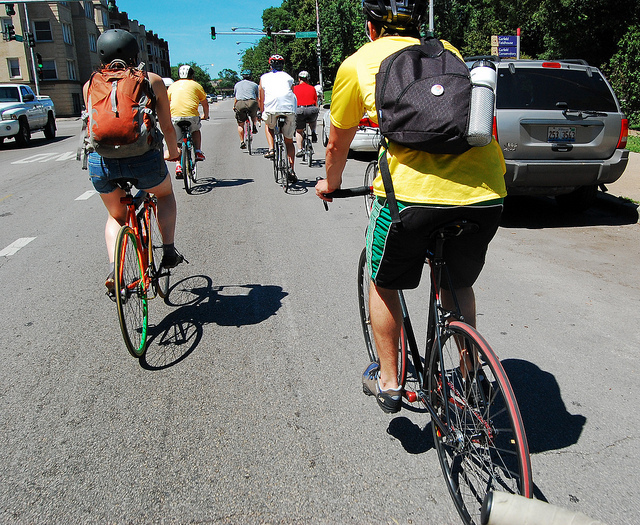 “The wide range of environmental, social, and economic benefits of walking and bicycling, so clearly documented in this report, justify greatly increased investment in facilities and programs to encourage more walking and cycling, and to improve the safety of these most sustainable of all transportation modes,” Pucher explained. In 2009, 40% of trips in the United States were shorter than 2 miles, yet 87% of these trips are by car. Twenty-seven percent of trips were shorter than 1 mile. Still, Americans use their cars for 62% of these trips. Seniors are the most vulnerable bicyclists and pedestrians. Adults over 65 make up 10% of walking trips, yet comprise 19% of pedestrian fatalities. This age group accounts for 6% of bicycling trips, yet 10% of bicyclist fatalities. On average, the largest 51 U.S. cities show a 29% increase in bicycle facilities since the 2010 report. Cities report that 20,908 miles of bicycle facilities and 7,079 miles of pedestrian facilities are planned for the coming years (much of this contingent upon funding). The Centers for Disease Control and Prevention and support from AARP and Planet Bike funded the report. Cycling in Three World Cities: How Do They Compare?